Photo credit: Mike Faulk, Yakima Herald-Republic. 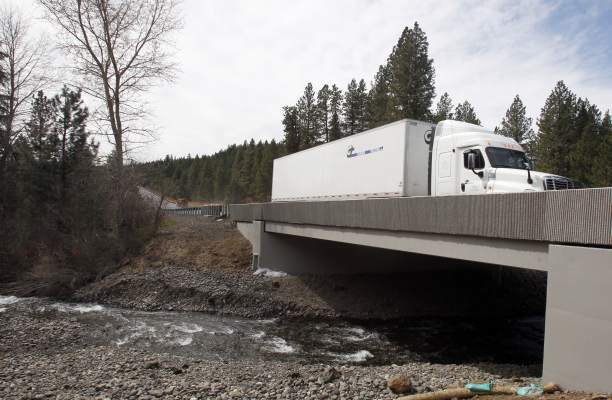 A truck drives over a newly constructed bridge over Butler Creek along U.S. 97 near Goldendale that was constructed to allow migratory animals -- mainly deer that are frequently stuck on the stretch of roadway -- to cross without putting themselves or drivers in danger on the roadway. The new bridge also improves fish habitat by replacing a culvert that prevented fish passage. Photo credit: Mike Faulk, Yakima Herald-Republic. Work along U.S. 97 near Goldendale to allow migratory animals to cross without putting themselves or drivers in danger on the roadway. Photo credit: Mike Faulk, Yakima Herald-Republic. Motorists know they’re not alone on the most rural and isolated stretches of the state’s highway system. Deer, elk, cougars and black bears all roam places otherwise relatively untouched, save for the highways where drivers speed through. But those scenic highways interrupt migration paths for animals. And in Washington alone, there are roughly 3,000 collisions annually between vehicles and wildlife, according to the state Department of Transportation. The DOT, like similar agencies across the Western U.S. and Canada, is looking at ways to keep the highways safe for both people and wildlife. However, financial crunches hitting many states could slow efforts. That’s in contrast to the last decade, when efforts to build wildlife overpasses and underpasses grew in popularity after vehicle-wildlife collisions increased through the 1990s. 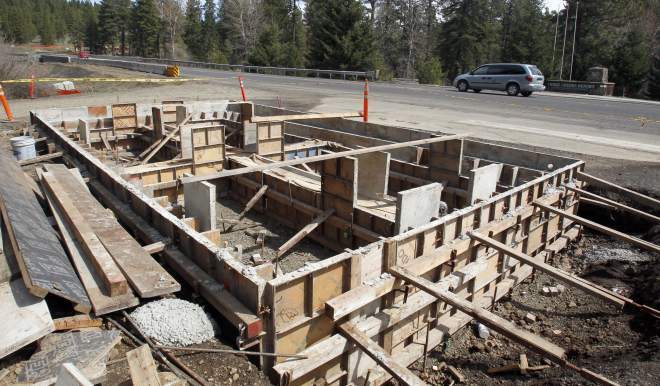 One such project is nearing completion about 10 miles north of Goldendale on U.S. Highway 97 on a stretch of road where the Transportation Department estimates there are 50 to 85 collisions a year involving large wildlife, such as deer. 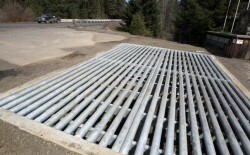 Like similar projects, this will allow deer and other wildlife to cross under the highway without endangering either vehicles or themselves. The $2.9 million project, funded by money from the 2005 gas tax increase, establishes a large wildlife underpass under a bridge over Butler Creek that allows wildlife to migrate uninterrupted; it also improves fish passage. Kelly McAllister, a DOT wildlife biologist in Olympia, said the state’s estimates are based on the number of large animals found struck by vehicles on the highway, but those numbers are generally considered to represent just a third of the collisions that take place in an area. “These are very much minimum numbers,” McAllister said in a telephone interview. Photo credit: Mike Faulk, Yakima Herald-Republic. A motorist drives past a newly constructed guard to prevent deer from entering a stretch of U.S. 97 near Goldendale. 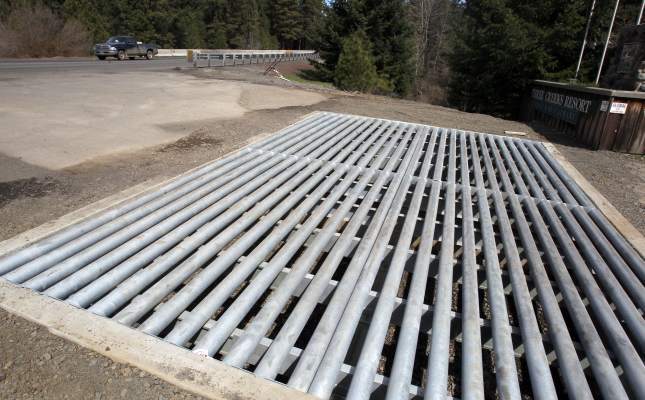 The guard works like a cattle guard, but is wider to prevent deer from jumping over it. In many cases, the stricken animals manage to make their way off the road, only to die of their injuries some distance away. According to the Wildlife Conservation Society, a New York-based nonprofit that tries to promote these projects nationally, the number of reported collisions with large wildlife increased nationally from 200,000 in 1990 to 300,000 in 2004. Using a laundry list of factors, ranging from government expenses for cleanup and loss of hunting revenue to motorists’ insurance and health care costs, the society estimates $8 billion was spent on wildlife accidents nationally in 2012. Jon Beckmann, North American projects coordinator for the Wildlife Conservation Society based in Bozeman, Mont., said the expensive wildlife preservation projects ultimately save money and potentially save lives. “There’s an up-front expense, but in the long run they not only improve safety for wildlife and humans, but save money in most cases,” Beckmann said in a telephone interview. 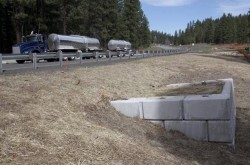 Washington state built two of the first such wildlife connectivity underpasses in the nation near North Bend in 1974, McAllister said, and several more are currently under construction as part of the Snoqualmie Pass East expansion project. McAllister said that in 1974, such projects were estimated to cost between $180,000 and $250,000. Now with projects costing millions of dollars and a state budget hard-pressed to even fund basic preservation and improvement projects, he said they don’t expect any additional habitat connectivity projects to be funded in the 2013-15 biennium. “We’re looking to a biennium that has very little money for these types of projects,” McAllister said. The state Transportation Department has a list of eight such future projects with rough conceptual designs and price estimates. The projects, which include crossings on U.S. Highway 12 near Rimrock Lake and Packwood as well as spots on U.S. 97 near Liberty and Omak, would cost a combined $32.1 million. Beyond the biennium, McAllister said it’s likely those projects won’t receive funding consideration for at least the next five to 10 years. 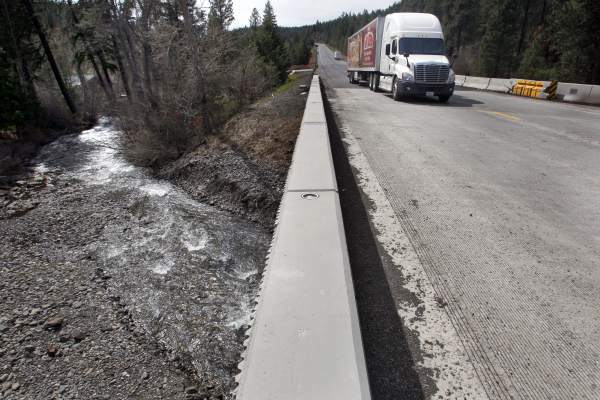 “Some of these areas have similar high collision rates to Goldendale,” he said. 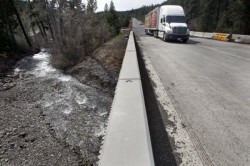 Beckmann said efforts to provide safe passage for wildlife over and under major highways has been led mostly by state departments of transportation, but in recent years the federal government has taken a closer look at the issue. The Moving Ahead for Progress in the 21st Century Act, a multi-year transportation funding package signed by President Barack Obama last summer, included language directing all state departments to consider such wildlife projects. “There’s potential for federal funding as they start to think about this,” Beckmann said. Although Western states have led the effort, projects also are underway on the East Coast in Florida, North Carolina and Vermont, Beckmann said. “A lot of states are coming on very rapidly,” he said. Mike Faulk can be reached at 509-577-7675 or mfaulk@yakimaherald.com. Follow him on Twitter at twitter.com/Mike_Faulk.